Easy to select the image to be restored. Description field for each image to describe it. Easy to select the disk to be clone. Reports for all action done in the ARecover Live. ARecover Live can be used to image or clone individual or many computers using a CD/DVD or USB flash drive. Though the image size is limited by the boot media's storage capacity, this problem can be eliminated by using a network filesystem such as sshfs(can create using AClone Server) or samba (Windows shared folder). To install ARecover live, the basic steps are to download pre-build ARecover Live then put it in a boot media (CD, USB flash drive or USB hard drive). Two types of files are available, iso and exe. The former one is for CD, the latter is for USB flash drive. Download an ISO file for CD/DVD. Then you can burn the iso file to a CD/DVD with any burnning program, such K3b on GNU/Linux orInfraRecorder on MS Windows (or disk image recorder), and remeber to choose "Burn Image" to burn the ISO file on the CD. The CD can then be used to boot the machine (PC, MacOs, Virtual Machine,..) you want to image or clone. To put ARecover live on a USB flash drive or USB hard drive, go to download . Once you have the bootable ARecover Live media, as created in the previous step, you can boot it in the machine you want to clone. Remember to use the ARecover live media, such as CD/DVD or USB flash drive. 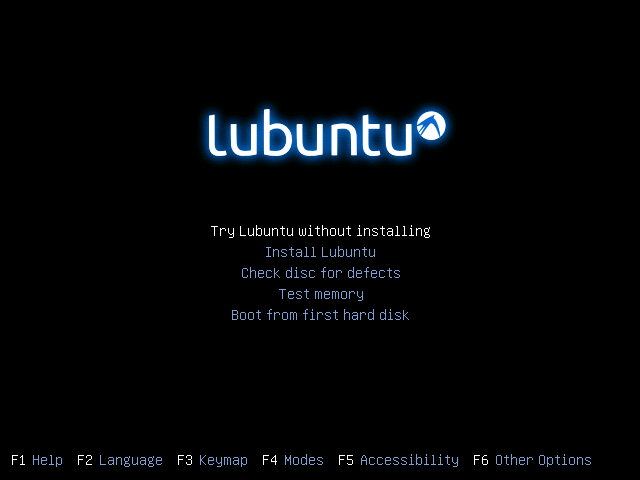 For example, if you have ARecover Live in USB flash drive, you have to boot it via USB device (Ex. USB-HDD or USB-ZIP). If necessary, you can set the first boot priority in the BIOS as USB-HDD or USB-ZIP so that it can boot ARecover Live from your USB flash drive. The network settings should be configured only if you do not have an active DHCP service or if we use the resources of aclone Server (save or restore image for sshfs or multicast) otherwise skip this step. Configure the network or if you want to use to restore multiple computers simultaneously change only the final number of IP 192.168.99.X. Click Apply Settings and wait. NFS / sshfs server . In this option we will need the linux server running ( aclone Server ) and so we can perform cloning single or multiple computers at the same time . To use this storage is necessary that the network is configured correctly ( as in the previous section ), enter the correct IP of the server and click the "mount" button. An external device ( Hard Disk or USB Flash Drive / USB stick ) . To use this storage will be needed only select the device and click the "mount" button. In this type of storage only individual able to perform cloning . Use a Windows shared folder ( samba ) . To use this storage is necessary that the network is configured correctly and thus be able to access the network folder and to configure this storage will be needed only enter the network path ( example : / / 192.168.1.100/images and fill in the login and password fields which can be a local user or a domain user - Active Directory ), and then click the "mount" button. In this type of storage only individual able to perform cloning . Note : If you want to switch from one storage type to another will be necessary to disassemble ( click the "unmount " button ) and then mount the desired type of storage. In this screen we will configure a name for the image (it will be saved in the storage location "/home/partimag/" that we defined in the previous section), select the disk that will clone (sda, sdb, ...) and you can put a note on the image that is being created to be used in the future and know that the image contains information (such as operating system, installed software, and others.). We can also choose what we want to accomplish with your computer once you finish the restore process: shut down, restart, or do nothing. Finally, simply click the button "CLICK HERE TO SAVE THE IMAGE". In this screen we set which image will be restored to the local computer, for this just select the image and the disk and clicking on the button "CLICK HERE TO RESTORE IMAGE". See we have a flap of "information" where we can get various information of the image that we are trying to restore (as operacional system, installed software, creation date, and others). We can also choose what we want to accomplish with your computer once you finish the restore process: shut down, restart, or do nothing. Warning, the disk being restored must be equal or greater than the source disk (when the image was created). This screen is amazing! It interacts with AClone Server and Clonezilla SE - Server Edition . The server will set to restore a particular image in multicast ( click here for more details ) and the screen below , when we click the "REFRESH " button it will fetch all the images available and also the disk image that we want to restore in multicast mode ( massive restoration - large scale and high performance ) . This REFRESH use broadcast data, if not fill automatically , we can select the image in the list and fill out the disc manually. We can also choose what we want to accomplish with your computer once you finish the restore process : shut down, restart , or do nothing . Finally , simply click the " CLICK HERE TO RESTORE IMAGE " button, check that the process will start and it will stop in the Partclone screen, waiting synchronize all computers, ie if in the AClone Server you set that will start to restore 10 computers and/or " x " minutes of time , this screen will pursue this stop only when the 10 computers connect to the server (stopping in the PARTCLONE screen) and/or when the occured the time-out ("X" minutes). 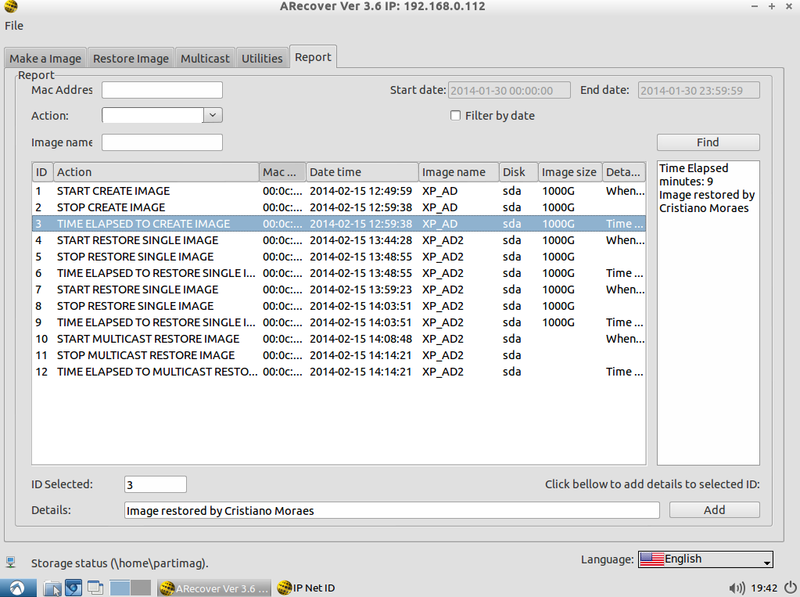 All actions within the ARecover Live (create an image, individual image restore and image restore for multiple computers) will be generated reports with information: date and time, MAC address, image's name, selected disk, disk size and field of observation (which may be added more observations). This way we can see the entire history of catering to a particular computer by its MAC address or a specific period. Very useful for detecting problem in HD or any hardware computer while it is being restored several times in a short period of time.